Edison Depot is holding a toy drive through Dec. 15. Shown are pastor Ed Colegrove of Edison Enterprise Baptist Church, owner Patty Collins, general manager Brenda Cain and kitchen manager Terry Currington. EDISON — Patty Collins saw a need in the community and decided to do something about it. 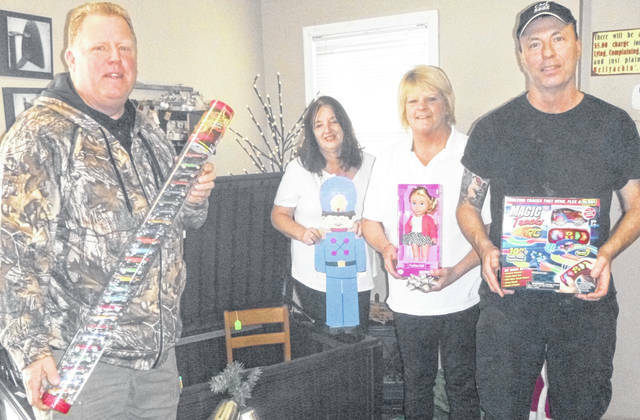 Collins, owner of the Edison Depot restaurant, is spearheading a countywide Christmas toy drive. “We are working with other businesses and ODJFS to collect toys. We want to give children whatever we can,” Collins said. She is collecting gift cards from area businesses including El Cabanita, Boondocks, The Purple Indian and others. Her business donated 10 gift cards. There are two outlets where residents can help. Toys can be taken to the Edison Depot, 552 W. High St., or to Kroger in Mount Gilead. First Knox Bank is collecting monetary donations. “We are working to get others and veterans groups to take part too,” Collins said. A 50/50 raffle also is under way. The toy drive goes through Saturday, Dec. 15 with toys to be given away the following week. “The need gets bigger and bigger every year. A lot of people want to help,” she said. The toys will be dispersed through Edison Enterprise Baptist Church’s food pantry. Residents may register a child in need of a toy with the church. Hot Wheels, dolls and games have been donated so far. Pastor Ed Colegrove likes being part of the outreach. “We are in a partnership with Patty. We’re acting as the distribution point for what they’re doing. We’ll have kids from the far ends of the county, not just Mount Gilead and Edison,” he said. Collins is motivated by a simple desire.